San Francisco (Obama.net)- In the United States of America, jobs within the legal profession are very respectable. After going to law school, many start to intern at law firms, then hopefully get a job at the same firm. Eventually, the goal is to become a partner and thus a successful lawyer. Of all of the men and women who attain that success, some get the opportunity to be a judge. And of all the judge positions in the United States, a seat on the Supreme Court is the highest honor. 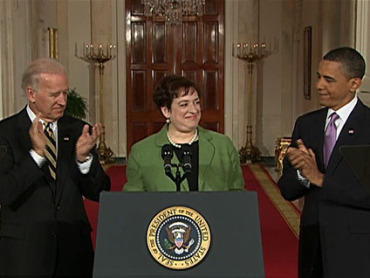 And on Thursday, President Barack Obama’s nomination, Elena Kagan was given that honor. After being evaluated for the past few months and having her background and character checked in great detail. Kagan won the vote by 63 to 37 in the Senate Thursday. She received some bipartisan support with five votes from Republicans. Other Republicans try to convince others to vote against her and attempted a filibuster, but were unsuccessful in both. Kagan is now the 112th Supreme Court Justice in United States history. As a member of the Supreme Court, she is now going to sit in her new seat for life. Following her swearing in on Saturday, she will begin her new role instantly. Replacing Justice John Paul Stevens, Kagan is the second person appointed to the United States Supreme Court by President Barack Obama in the last year, the first being Sonia Sotomayor. Democrats were initially excited with President Obama’s nomination in May, and now they are truly happy with the approval of Elena Kagan, as she represents much of what the Democratic Party stands for in the United States of America.